I recently came across some code for communicating with KS devices. 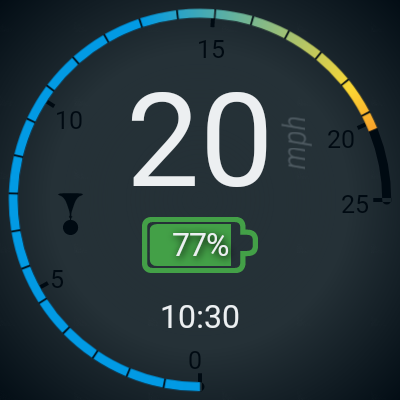 I've always wanted an Android Wear app for my KS-16S, and now I've my own app that works for me. I still need to display a few things like distance, temp. and current. The app does not require a phone, as it communicates directly with the wheel. It's KingSong only for now. I'm interested in this. We had some talk about a wear os version of the wheellog watch app. Did you look at that? Then you don't have to build support per device (since that would be wheellog job). Good point! If WheelLog has all of the comms. worked out, that may be a good place to integrate. I didn't realize WheelLog was open source. I'll have to look to see how the Pebble version was implemented. Glad to hear you have an interest...thanks for the tip! I'm interested as well, like your display screen. This would be awesome for my daily commute. There is also a time (Samsung watch) one implemented, that was most recent and you can see the GitHub diff on how they did it. Very interested ! I will pay $4 for this kind of app on my watch ! Keep working on this project. Pets have to wait :-) Definitely looking for this type of wearable. I can have iwatch with DarknessBot but still have to carry iPhone. I like the idea of not needing a phone. I would certainly be interested. Thanks everyone for the feedback. I think this is enough interest to motivate me. What I'll do is aim to get what I have into Google Play with some small additions in the next few weeks. This will be KingSong only for now. From there, I'll collect feedback and do some research into broadening this out to some more wheels. In the back of my mind, I still hope to keep this unteathered from the phone. In the mean time, if anyone can think of some useful data that isn't on the screenshot I have above, let me know. As I mentioned, I plan on displaying distance, temp, and current one way or another. Also I imagine current wheel temperature might be good to have. I like the look of it, though I only have a gotway and ninebot c+ currently i'm sure i'll have a KS someday and so this would be cool to have as another option to wheellog since it doesn't really support newer android wear smartwatches without a phone link from what I've heard. Thanks @Zanoni ! I think top speed, top current, and current battery/speed/current/km/temp, total km will be more then enough, With the possibility to choose as main display one of theses. Real plus value for your app is certainly the fact that phone is not mandatory. I have two more people not on the forum that are interested in this project. The key interest is in a watch that can communicate speed without a phone. Battery level it great everything else is extra. 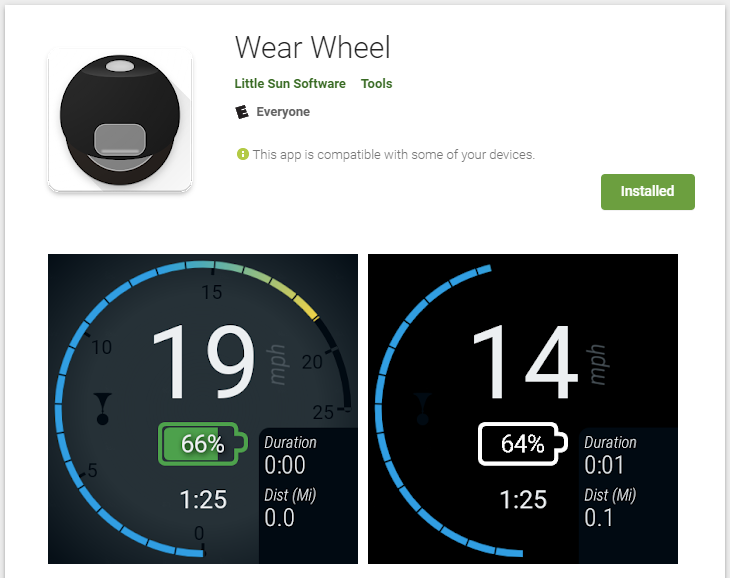 I have submitted a first version of this app to Google Play, however there is a review process for stand-alone Android Wear apps, which may take a few days. During the review period, it seems that I'm allowed to distribute the app to "Internal Testers", of whom I need to invite via email. If you have a supported Android Wear device (see the attached list) and a KingSong wheel, and are willing to help provide some early feedback, send me a Private Message and include the email that is associated with your Google Play account. I will add that email address to the list of testers, and send you a link to the App on the Google Play Store where you can start the Install. Note that in a future release I'll let you override this with a preference. There's just no UI for this now. * This only finds bluetooth devices with names starting with "KS". It looks like the app has been approved by Google, and is available now. Head on over to the Google Play Store to install! I've only tested this on the equipment available to me, so if you run into any issues, please let me know! For simplicity, you can send feedback to , or send me a private message. Reminder, this only works with KingSong EUCs for now. See the attachment on my previous post for compatible watches. Another disclaimer. I've done my best to keep battery usage low, but since the weather has been particularly bad here for the last few weeks, I haven't had much chance to test for long periods of time. You may notice that, in ambient mode, the data updates about once every second. Let me know how that works for you, and whether your watch battery is suffering beyond expectation. Thanks everyone, please be safe, and I look forward to your feedback so that I can make this even better! O@Zanoni is it only showing mph or can it be switched to kmh as well? It should be set automatically based on your locale. In the future, when I create a setting screen it will be something you can override. Awesome awesome !!!!! I've just ordered a new watch as my previous one died after almost 3 years... Can't wait !!! LG Watch Sport 4G/LTE... my previous was LG Urban 2 and I liked it a lot... I checked ticwatch pro too and it seems to be a good option too. I need 4G/LTE. This looks fantastic. I just ordered an inmotion v10 and would love if you could add support for inmotion. Thanks! Ooh, a new EUC coming in the post. That's exciting! This weekend, if I get some time, I will be looking into my options for adding more devices. By the way, I haven't received any feedback yet. Has anyone had a chance to try the app?